What is the radiation pressure? as a pressure in the medium in which the electromagnetic radiation propagates. dB calculator to see what pressure is created by sound waves. Have you ever heard about Cosmos 1 project to test a solar sail (lightsail) in space? In this mission, the spacecraft named Cosmos 1 was supposed to increase its velocity using radiation pressure. Read on if you want to know how solar sails work and what is the physics behind them. Because electromagnetic waves carry energy, we can expect them to carry momentum as well. This electromagnetic radiation can be viewed in terms of particles which are known as photons (check our De Broglie wavelength calculator). When photons hit a surface, they exert a force onto that surface. The momentum of photons will be absorbed by the surface (if the material is opaque) or reflected (partially reflected). Is radiation pressure a significant phenomenon? Let's consider the hot interior of a star. All matter with a temperature higher than absolute zero emits electromagnetic radiation described by the Planck's Law. On the other hand, you probably know that stars consist of particles which are held together by the gravitational force. Now, if there wouldn't be any radiation pressure, the star could collapse! Currently, we know that stars can exist for billions of years so we should take into consideration radiation pressure too. c is the speed of light c ≈ 2.99792458 * 10^8 m/s. In practice, materials are neither completely reflecting or absorbing, so the x will be between 1 and 2. In simple mode of our radiation pressure calculator, we assumed that the light falls perpendicular to the surface (α = 0°). If you want to change it, just go to the advanced mode. By comparison, the pressure of ordinary molecules in gases increases linearly with temperature ~T (see ideal gas law calculator). 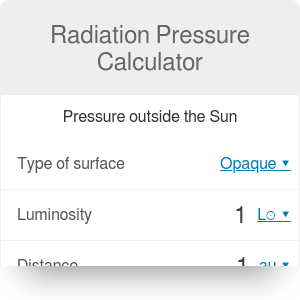 Let's use our radiation pressure calculator to compare what is the solar pressure on Earth and inside the Sun. If an absorbing surface is opaque, R = 1 au (one astronomical unit 1 au is an average distance between Earth and Sun) and L = 1 L☉ (one solar luminosity equals 1 L☉ = 3.828 * 10^26 W) we obtain p = 4.54 μPa. On the other hand, if we want to compute what is solar pressure inside the corona of the Sun (T = 5 000 000 K), we will get p = 157.6 GPa which is about 10^17 times bigger than that on Earth! You might want to express these pressures, for example, in atmospheres (atm). Check our pressure converter to learn how to do this. Solar sail (also called lightsail or photonsail) is a theoretical method of traveling in space using radiation pressure exerted by sunlight on large mirrors. It is just like the sailing boat when the wind is blowing a sail. People wanted to test the solar sail concept, and in 2005, they launched for the first time an orbital spacecraft named Cosmos 1 which had eight sail blades (15 m long with the total surface area of 600 square meters). Unfortunately, in the 83rd second of the flight, the engine broke down, and the whole vehicle fell back into the sea. However, since then several other satellites with the lightsail equipment were successfully launched into the orbit of the Earth. Radiation Pressure Calculator can be embedded on your website to enrich the content you wrote and make it easier for your visitors to understand your message.